January 26, 2015, 3:10 p.m.
Over the past thirty years inequality has reached levels unseen since before World War II, with a recent report from Oxfam estimating that 48% of all the world&apos;s wealth is now owned by the richest 1% of the population. By 2016 that figure is set to exceed 50%. As global inequality has increased, so has inequality in the United States and the rest of the Western world. Much of this has been attributed to changes in economic policy made in the 1980s, when Congress and the Reagan administration significantly lowered taxes on the wealthiest Americans in order to increase their incomes and thus the amount of money available for investment in businesses and the wider economy. The essence of the &apos;trickle down&apos; theory is that as taxes are lowered and investment increases, the economy as a whole will grow more quickly and lead to higher incomes for everyone. The 1980s and 1990s did see sustained economic growth, but for many ordinary Americans wages stagnated and the effects of the 2008 financial crisis wiped out what gains average workers had seen in the 80s and 90s. 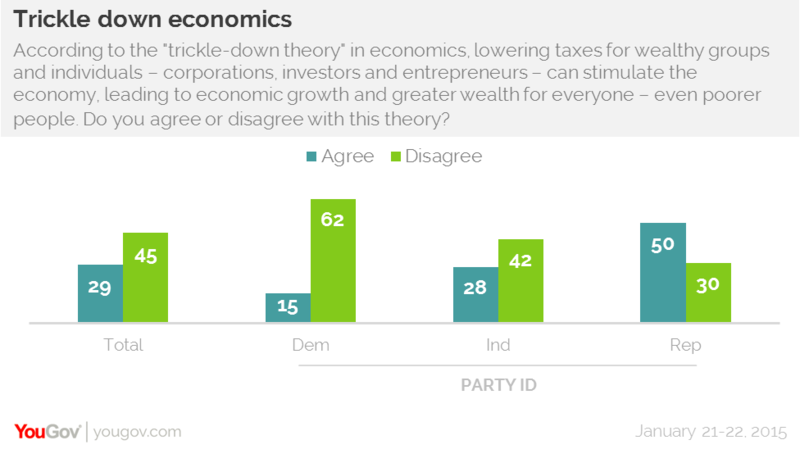 YouGov&apos;s latest research shows that Americans tend to be skeptical of the idea that lower taxes on the wealthy stimulates the economy, with the end result of greater wealth for everyone. 45% of Americans say that they disagree with the idea, while 29% say that they agree with it. Most Democrats (62%) disagree, while most Republicans (50%) agree with the theory. Independents tend to disagree (42%) rather than agree (28%) with the idea. Attitudes in the United Kingdom are broadly similar. Only 24% of Britons agree with the theory, while 51% disagree. The partisan split is also very similar, as right-wing Conservative voters tend to agree (45%) while most left-wing Labour voters disagree (63%). One of the major critiques of growing inequality, beyond the human cost of poverty, is that vast inequality undermines the stability of the economic and even political system. Overall, 36% of Americans think that inequality is pushing the world&apos;s economic system to an imminent crisis, while 27% think that a crisis is foreseeable but not imminent. 16% think that the world economic system can sustain growing inequality, while 21% don&apos;t know. Most Democrats (52%) believe that we are at the point of imminent crisis of inequality, something 34% of independents and only 22% of Republicans agree with. Republicans are evenly divided between the 32% who believe that inequality poses a distant threat to the world economic system, and the 32% who say that it does not pose a threat.